So many citizens spend their lives waiting for the chance to do something heroic; others are real heroes, just waiting for recognition; and the rest of us mostly blob around waiting for a chance to eat free fast food. 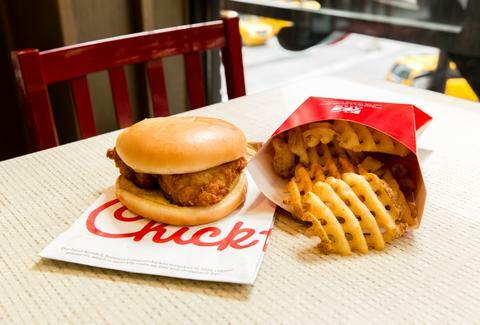 Now one lucky soul will have the chance to simultaneously fulfill all three of those equally understandable desires: If you solve a crime for this Chick-fil-A, you'll receive a year of free food in return and become a celebrated, well-fed champion of justice. The mystery is this: At 9:45pm on Sunday, someone stole a catering van from the parking lot of the Cartersville, Georgia Chick-fil-A (why you'd do this is a whole separate mystery). The criminal mastermind then promptly crashed the van into a parked car in a home's driveway, according to WSB-TV2. The suspect hasn't been found or identified. That's where you come in. If you can unmask the villain (so to speak -- there weren't actually any masks involved) the Chick-fil-A restaurant will furnish you with free fried chicken for an entire year. If you have information, they ask that you call 770-401-1239 or the City of Cartersville Police Department. Rest assured everything will be anonymous. Becoming a snitch is 100% worth free chicken, so if that person looks familiar, get on the phone and become the hero you were born to be. Also, if you do figure out why anyone would steal a catering van, please let us know. James Chrisman is a News Writer at Thrillist who considers himself a hero. Send news tips to news@thrillist.com and follow him on Twitter @james_chrisman2.